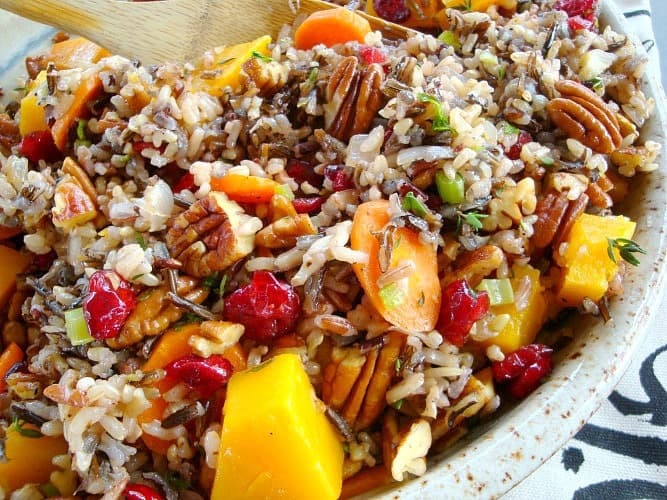 Colorful and festive are two words that describe this recipe for Wild Rice Pilaf with Squash, Cranberries and Pecans. Other words would be delicious, hearty, and healthy! 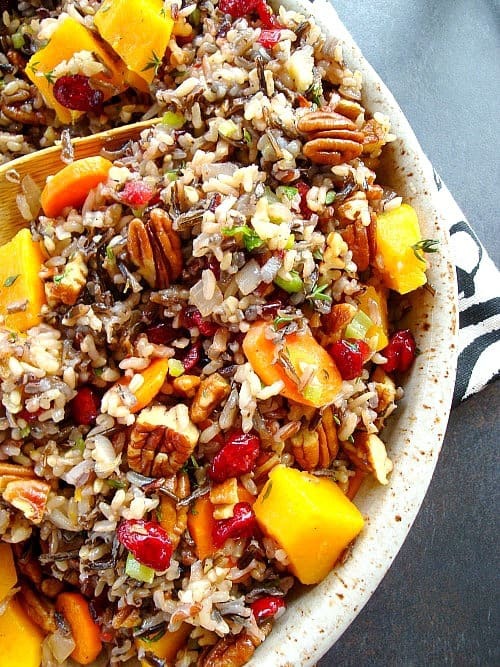 Start with wild rice or a wild rice blend and add either butternut or acorn squash. Pecans give a creamy crunch and fresh thyme adds a hint of pepper and lemon. Add the cranberries for a pop of color or leave them out if you’d rather. I added them this time but my family actually likes the flavor without the cranberries, making it even better for you! At the holidays, this is a great side dish or a good gluten free stuffing substitute. You can’t go wrong with this one. Feel free to change it up to make it your own. Use brown rice instead of wild if you don’t have it but the wild rice has a distinct flavor that really works in this dish. Shallots are preferred for their mild, sweet taste, but a regular yellow onion will do here, too. Hearty enough for a vegetarian main dish, as written this recipe serves four as a side or two as a main dish. Place wild rice or rice mix in medium sauce pan with 2 cups water. Bring to boil, reduce heat and cook 45-50 minutes, covered. The rice should be cooked, but firm. Cook squash by any of the following methods. Steam for 15 minutes. Or boil in water for 10 minutes. You can also roast the squash in a 450F for 20-25 minutes. Roasting gives the squash a deeper flavor due to caramelization. It is also the most time consuming method. For convenience, you can roast the squash 2 or 3 days ahead, refrigerate and use when needed. Meanwhile heat a large, wide skillet over medium low heat. 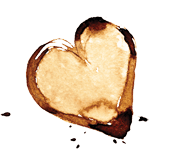 Gently toast the pecan halves until aromatic. Keep a close watch on the nuts. They go from lightly toasted to burnt in less than a minute. Transfer nuts to the board, cool, loose chop and reserve. Turn the heat to medium-high, heat butter and/or oil, and sauté onions and garlic until soft. Add celery, carrot and red pepper flakes, and stir-fry briskly for a couple of minutes. Then add cooked rice, squash, thyme, cranberries and pecans. Season to taste, toss to combine. This rice tastes great whether served warm or at room temperature. Recipe adapted from Tasty Palettes.